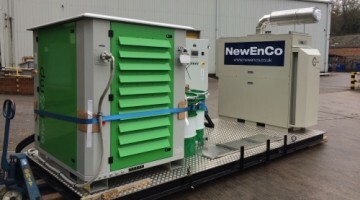 Newenco manufactured, installed and commissioned seventeen 50kWe microturbine packages at landfill sites accross the UK. 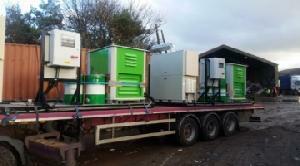 Following the success of our pilot Capstone Landfill Microgeneration Project at Suez Henthorn Landfill, we are currently supplying a further fifteen 50kW units to landfill sites around the UK. Last week, the first two of these units were shipped, the first being shown here arriving at Knapton Quarry, Malton, owned by Todd Waste. The second unit was delivered to Longman Landfill Site, Inverness, operated by Highlands County Council. The units will be commissioned before Christmas.